When I first hung out my shingle as an exercise therapist and kinesiologist, I actually had a lot of trouble helping my clients with hip and lower back pain. And I did the things that I was trained to do: recommend daily icing to reduce inflammation, prescribe anti-inflammatory medicines, standard exercises like hip extension, hip abduction, bridging, knee lifts, mini squats, etc. But, none of it really worked. Almost none of my clients got better. Some got temporary relief, but very few of them experienced long-term reduction or elimination of their pain. I was pretty discouraged and disappointed with these results. So I decided that I would need to find another way... because I got into this work in the first place TO HELP PEOPLE, for real. I started studying and scrutinizing related medical research papers. In the end, I went through hundreds of these papers and studies. I spoke with other trainers, therapists and kinesiologists to see if they had methods that worked to relieve hip and back pain in their clients. Then I brought everything I learned back to my clients, and tested and experimented... until I finally got the results I was looking for. Since this muscle is located in the same area, it was now easy to see why my clients believed it was their hips or back that hurt, and didn’t realize that the answer lie in this muscle called the Gluteus Medius. SO… I created a special set of exercises that specifically targeted the Gluteus Medius muscle. Voila! The results were incredible. NIGHT AND DAY! With this amazing discovery, my clients experienced FAST reduction and even elimination of hip and lower back pain… in DAYS not months (or never!). I was beyond excited and my clients were even more excited! Clients that had suffered chronic, intractable hip pain for years were telling me that they were throwing their grandkids up in the air, without a care! They were up and down stairs without pain or fear. They woke up feeling great, ready and excited for their day, instead of languishing under the dark cloud of pain they used to have following them around. People with back pain that literally immobilized them, that kept them from going to work, and even kept them from getting out of bed… were up and about, walking, even running and exercising with NO PAIN! Clients with milder cases were pain-free and fully back to normal in under 7 days! It was incredible - I was hooked. I knew that I had to take this special set of exercises beyond just the face-to-face, one-on-one clients I was seeing myself, and get it out to as many people as I could, because I had seen first-hand that IT REALLY WAS helping people eliminate their hip and back pain. So, I packaged up these special exercises into a video program that I call Best Gluteus Medius Exercises. I am so excited about this product. This might sound cheesy, but… it brings me a lot of joy and fulfillment to help people overcome their injuries and get back to doing what they love. I know that after using it for just a short period of time, you too will see how different this program is from anything else you’ve seen or tried. Have you been waiting for a solution that will ACTUALLY WORK? That REALLY WILL decrease and eliminate your hip or back pain? When you walk up or down stairs, get up from the couch, or get out of the car, you may find yourself doing some habitual things like groaning under your breath, or putting your hands on something to brace or lift yourself... but you’ll be SURPRISED and DELIGHTED to notice that the pain isn’t there anymore! You’ll wake up rested and refreshed in the morning, and you’ll realize that your pain isn’t there. Then you’ll realize that you don’t have to worry about pain in your hips and back today... or tomorrow... or the next day! DAY 1: In the beginning, you might wonder if this program really works, but you’ll soon start noticing some relief in your hip, back and lower body. DAY 2: It may be hard for you to describe it, but your pelvis and hips will feel a bit more stable, and this will make you feel like doing more of the exercises! DAY 3: The program is starting to feel like part of your life now, and you’re seeing that just a few minutes a day is ACTUALLY decreasing your hip and lower back pain. DAY 4: This is the day where most of my clients tell me that they wished they had found this program sooner! This is not just a bunch of exercises thrown together with the HOPE that they will relieve your pain. This is a CAREFULLY DESIGNED SYSTEM that has already helped many people decrease and eliminate their hip and lower back pain. All of your questions will be answered. I have diligently collected questions from each of my clients over the years, so you will have all the answers you need, and NEVER FEEL STUCK. And on the off-chance that I haven’t answered one of your questions, you can always email me personally at support@ExercisesForInjuries.com. What is the Best Gluteus Medius Exercises program? What exactly do you get with it? 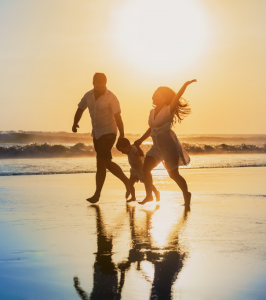 Below is a description of each component of the program and how it helps to MAKE SURE you get to your end goal >>> FAST REDUCTION AND ELIMINATION OF YOUR HIP AND BACK PAIN! It’s very important, before you get started, to assess your current condition. This is the first thing Rick does every time he sees a new client with hip and/or back pain. We need to understand how much pain you’re experiencing now, how serious your injury is, and what range of motion you can currently handle. Having this information will prevent further injury, and help you get the best possible results, in the shortest amount of time. In this component, you get a video and a brief manual that walk you through, step-by-step, how to do your own self-assessment. Based on this information, you’ll know exactly where to start in the Best Gluteus Medius Exercises program. 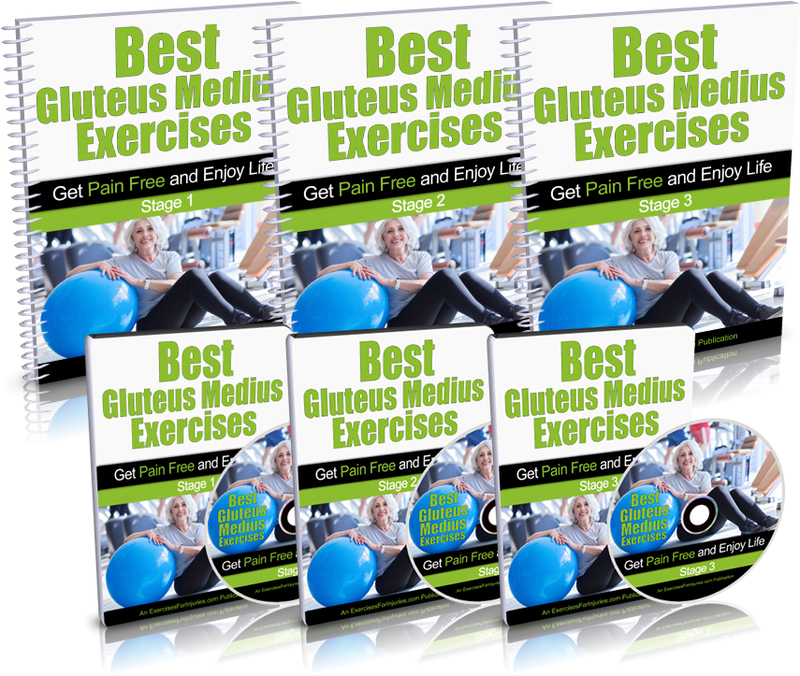 The Best Gluteus Medius Exercises program contains a wealth of educational information on hip and back pain, but I want you to come up to speed FAST on what you need to know, so you can get started FAST, and start reducing your pain FAST! So, I’ve distilled the educational content down to the most important summary points you need to get going right now. This Quick-Start Cheat Sheet will give you a brief overview. It explains exactly what causes hip and back pain, and what fixes it, and then it lays out the exact roadmap we’re going to follow in this program to get you back to pain-free hips and a pain-free back! 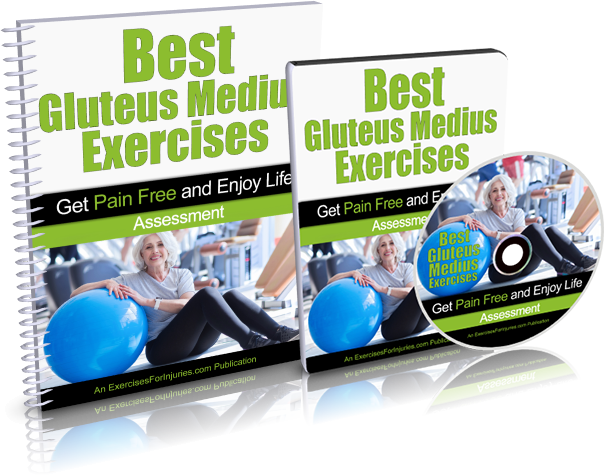 Best Gluteus Medius Exercises is a comprehensive program of gentle, yet highly-effective exercises designed to reduce and eliminate your hip and back pain, in as little as 7 days! The program is broken out into 3 stages. The 3 stages progress from very easy (Stage 1) to more challenging (Stage 3). This 3-stage structure ensures that any person can complete this program and solve their hip and back pain for good, even those who have severe hip and back pain, and even those who have never exercised a day in their life! The 3 different stages also allow you to self-direct your progress so you get the fastest possible recovery. FOLLOW-ALONG VIDEOS: You also get 3 follow-along videos - 1 for each of the 3 stages. 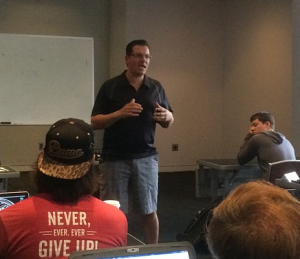 These videos are your very own personal coaching sessions with Rick. In them, you will do each of the exercises following right along with Rick’s exercise assistant, who does them on video with you, while Rick counts out time and reps, and coaches you along the way. As mentioned above, for each of the 3 stages in the Best Gluteus Medius Exercises program, you get an instructional video, a follow-along video, and a comprehensive manual. How my Best Gluteus Medius Exercises program gives YOU all the control, makes your life simpler and easier, helps you learn the exercises faster, and saves you money. You can watch the videos on your schedule, when it’s convenient for you. No scheduled appointments to make, no time off from work - you can do it whenever YOU have time. 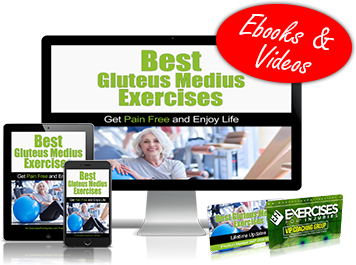 Get INSTANT ONLINE ACCESS to the Best Gluteus Medius Exercises Program. You get lifetime access to everything 24/7/365, on any computer or mobile device. Test drive my whole Best Gluteus Medius Exercises program for the next 60 days with absolutely no risk. You are fully protected by my iron-clad 100% money-back guarantee. If for any reason, you aren’t completely thrilled and amazed with Best Gluteus Medius Exercises, you can simply email me and ask for a prompt and courteous, no-hassles, no-questions-asked, 100% refund. In fact, if you’re not completely happy, then I insist that you ask for a refund. After seeing so many people overcome their hip and lower back pain with this program, I am confident that you will be thrilled as well. If you don’t already know me, my name is Rick Kaselj. I’m an exercise and injuries expert and international presenter for effective exercises for injuries. I have written numerous articles that have appeared in newspapers and fitness magazines, have written leading exercise injury manuals, and have given over 315 presentations to more than 6,000 health and fitness professionals across Canada and the USA. P.S. – There is NO RISK at all for you when you try Best Gluteus Medius Exercises. If you are not completely thrilled with how this program helps you decrease and eliminate your hip and lower back pain, let me know and I will refund your order. Your satisfaction is 100% guaranteed. Rick Kaselj has been trusted by the largest fitness & rehabilitation associations in North America (NSCA, ACE, CanFitPro, BCRPA, BCAK, CKA, NHPC). P.P.S. – There’s only one catch to all this. You need to act now to get this program at this price. I’ve been told by several people that the price for this program is way too low, so it will be going up very soon. I’ve heard before that I need to strengthen my Gluteus Medius muscle - is that true? 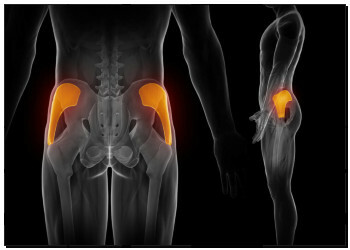 Strengthening your gluteus medius muscle is important, but not the only thing you need to do. You also need to focus on activation, endurance and strength of the muscle. A strong muscle does not mean it is a muscle with good endurance. Good endurance is crucial for injury recovery and prevention. Your program is a 12-week program. Why does it take so long to work? If you follow this program and do the exercises as I instruct, your back, hip and lower body should all feel better within 7 days. The reason I say this program should IDEALLY be followed for at least 12 weeks is because I know you want to overcome your hip and low back pain COMPLETELY. If you want to do that, I’ve found that it takes, on average, about 12 weeks. I don’t want to give you a temporary fix; I want to give you long-term relief. Long-term relief is what the Best Gluteus Medius Exercises program offers. You don’t have to wait! 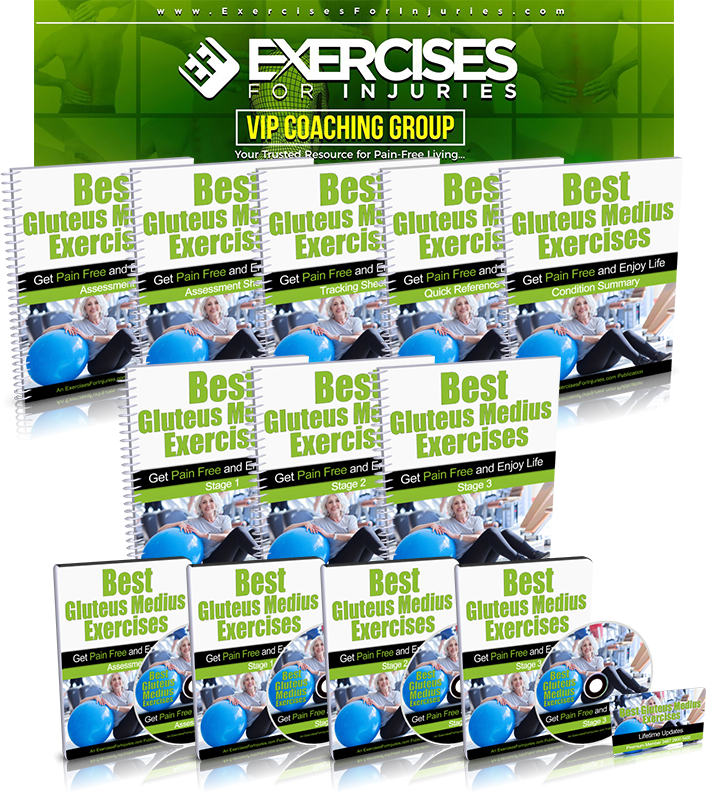 You get access to everything in the Best Gluteus Medius Exercises Program immediately after you order. You can download everything onto your computer and get started right away. No waiting for anything in the mail. Can I watch it on my smartphone or tablet? Absolutely! The videos are M4V format that you can view on any computer, tablet, or smartphone. I was surfing around the Internet and found a bunch of Gluteus Medius exercises. Will these help? 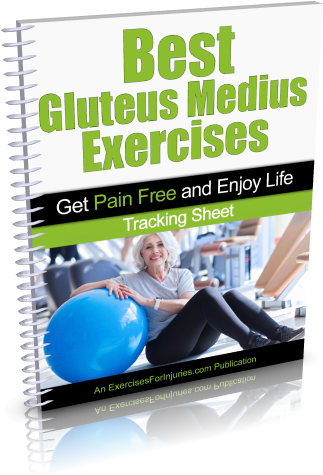 You can definitely find exercises for the gluteus medius online. But you won’t find a complete program designed to target the gluteus medius muscle for the specific purpose of relieving and eliminating hip and back pain. You won’t find a whole program that has been carefully crafted, based on years of research and real-world testing, that includes ONLY the necessary exercises, with instructions on how to do them in just the right sequence, with the right number of reps and sets, so that you will reach your ultimate goal, which is to be pain-free in your hips and lower back. That’s exactly what Best Gluteus Medius Exercises program is all about. Yes, and no. Most fitness and health professionals take a shotgun approach to exercises for injuries. They keep giving you more and more exercises, hoping they will help. I don’t do that. My program only includes the exercises you need. I also recommend you do them in a specific sequence and I give you precise instructions on how many repetitions and sets you need to do. My program has been carefully designed, based on years of research and real-world testing, and it is a SYSTEM that has already worked for other people. There will be no guesswork or confusion on your part – everything is laid out and easy for you to follow. My best advice is for you to stop all of the other exercises you are doing, and focus only on the Best Gluteus Medius Exercises Program for at least the next 7 days. 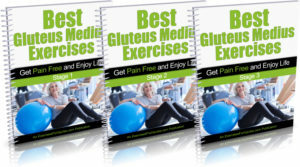 NOTE: The Best Gluteus Medius Exercises program is a set of 7 downloadable videos, and 12 PDF files. No physical products will be shipped. After you order, you will get INSTANT ACCESS to download the videos, PDFs and e-books. The PDF files can be viewed on any Mac or PC. The video format is M4V which can be viewed on any Mac or PC. If you have any questions or need help, you can contact us at support@ExercisesForInjuries.com.